KILBURN manufactures following skid-mounted packages for Off-shore Oil Exploration / Process Platforms. KILBURN has supplied more than 150 Instruments and Utility Gas Drying system for unmanned oil well platforms. 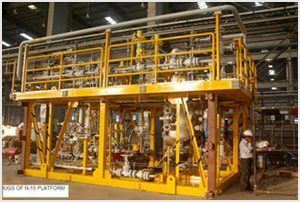 Depending on platform requirement for compressed gas as a utility or as an instrument gas, these skids are designed to achieve required quality of the gas with the help of naturally cooled finned pipe cooler and precisely engineered filter-separator with automatic draining arrangement. Any combinations of the above are used to achieve optimally designed, automatically operated with pneumatic control panel, instrument and utility gas skid. The skids are delivered as complete assembled unit & ready to install, connect and operate. These skids are engineered, taking into consideration space & weight constraints of oil exploration platforms with adequate access for maintenance of the skid components. Skids are delivered duly tested in assembled condition. Engineering is backed up with a vast experience of KILBURN in this field. These skids are manufactured with material such as NACE , SSCC & HIC test requirements. Experience of more than 150 Instrument Utility skids delivered in the last about four decades. Special material of construction such as Duplex Stainless Steel with SSCC, HIC test and Incoloy for corrosive well fluids. Gas conditioning system is designed, engineered, manufactured and supplied for delivering conditioned fuel gas for further applications such as driving turbine. These skids are engineered to achieve precise parameters such as pressure & temperature of the fuel gas. This helps to maintain proper operation of turbine on oil processing platforms. Depending on condition and composition of input gas and required final condition for the fuel gas, pressure scheme is finalised which include filters, phase separators, heaters, coolers, with optimally configured controls and instruments to give desired output of conditioned gas with a variation in feed input gas. The skids are delivered as complete assembled units ready to install, connect and operate. These skids are engineered taking into consideration space & weight constraints of oil platforms & with adequate access for maintenance of the skid components. KILBURN design & manufactures this system with technology sourced from reputed overseas companies. Inlet manifold skids facilitate connection of various oil wells with production header. Inlet manifold skids are engineered for an easy and quick access for isolation of oil well by diverting part of crude oil / gas to a test separator or to isolate the oil well completely for any purpose. This complete skid is designed to have an easy access for operation, maintenance of high pressure valves handling corrosive well fluid. 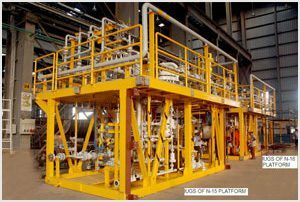 The complete skid is delivered duly assembled, ready to install, connect and operate thus saving considerable time for assembly of piping on the oil well platform. These are designed to facilitate determination of condition of oil well and to give an advance intimation of the composition to process platforms. KILBURN has successfully designed 3-phase (oil, gas & water)test separator skid with a facility for measurement of flow in each phase, simultaneously. 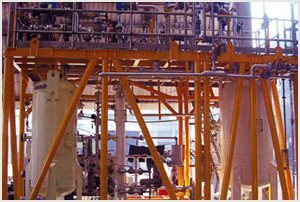 The test separator skid is designed taking into consideration the variations which occur in the composition, pressure and temperature. These skids are suitable for wide range of various operation parameters. KILBURN delivers skids complete with test separator vessel, piping, various instruments, control valves. These skids are ready for operation immediately after installation. 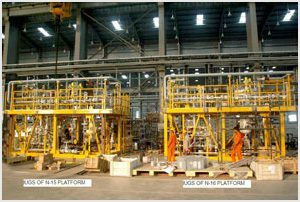 These skids are designed taking into consideration various constraints of well platforms and adequate access for maintenance of various items on the skids. KILBURN designs, manufactures and supplies suitable skids for water injection into the well as & when required. The skids are complete in all respect for injecting controlled quantity of water into the well. They are engineered to take care of variations of flow and pressure for water injection. The skid is designed & engineered to enable the user to install, connect and operate. These skids are designed, engineered and manufactured with Kilburn’s vast experience in the field. Skids are designed optimally keeping platform constraints in mind as well as the maintenance of various components on the skids.